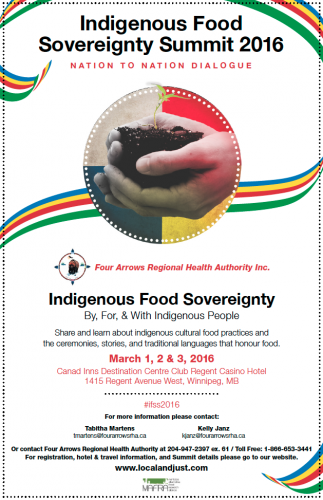 Join Four Arrows Regional Health Authority on March 1, 2, & 3rd to share and learn about indigenous cultural food practices and the ceremonies, stories, and traditional languages that honour food. Registration: Registration is $500 + GST and includes all daytime events, lunch, nutrition breaks, and entrance to the Food & Film Night on Tuesday evening, March 1st. For those paying by credit card, please register using Eventbrite here. Please note that an extra processing fee will be added to the cost of registration using this payment option. For those paying by cheque, please download the registration form here. Mail registration form & payment before February 19th to: Four Arrows RHA, 200-338 Broadway, Winnipeg, MB R3C 0T2. Gala Dinner: Tickets are also available for the Gala dinner on Wednesday, March 2nd, featuring traditional indigenous food and entertainment by Florent Vollant. Tickets are $100 + GST and can be purchased through Eventbrite or by cheque. Vendor Tables: A limited number of vendor tables are available for the three days of the Summit. Registration is $500 + GST and includes all daytime events, lunch, nutrition breaks, and entrance to the Food & Film Night on Tuesday evening, March 1st. For those paying by cheque, please download the vendor registration form here. Mail registration form & payment before February 19th to: Four Arrows RHA, 200-338 Broadway, Winnipeg, MB R3C 0T2.